Today Ukraine is travelling in the midst of complicated lethal desert of their historic way to the complete liberty in the land granted by God. We often go through the temptations what Israelites felt in the desert. We blame the Lord, and the guides too. It seems to us that three or four years ago would be better than now. Similarly, Israelites thought that remaining in Egypt’s slavery is better than follow God to the Land of Israel. 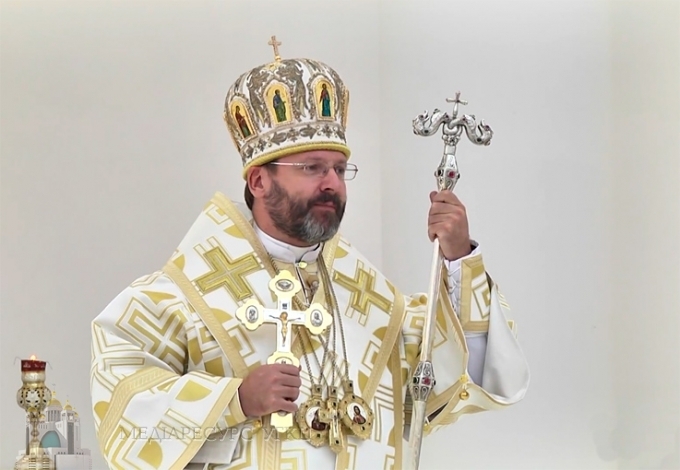 Father and Head pf Ukrainian Greek Catholic Church His Beatitude Sviatoslav talked about it during his homily to the faithful in the Patriarchal Cathedral of the Resurrection of Christ in Kyiv. Talking about human’s sin, His Beatitude Sviatoslav mentioned: when a person does something wrong, instinctively, subconsciously they try to hide it, show it to no one, even though they want to find excuses for the evil they have done. “Thus, Christ says, who don’t believe in the Resurrected, don’t accept salvation, is similar to a person who is afraid of light because their deeds are malicious. But Christ brings to light all our wicked deeds not for punishing or judging us, but to save us from them, give us life, set us free from evil, as it happened to Moses when he by showing a bronze serpent was salving God’s people. Christ does likewise, putting all our sins in front of our eyes, taken up to the cross, saving me from them, and when I believe this, grants me salvation and eternal life”, spiritual leader of Greek Catholics considers. “So, let us not hide our wicked acts, let us appear on the light with them, because darkness fears light and evil fears clarity and truth about it. When we, Christians, are doing something wrong, we take these acts of ours to the Confession. We believe that merciful God, Who gives us eternal life in His crucified Son is stronger than sin and its lethal power what might be brought into our life. Since everyone who believes in it will live an eternal life”. Thinking of Ukrainian realities, Head of UGCC mentioned: “So it happens that today we are bitten by our own crimes and sins, collected throughout 25 years of Independence. “How much of this poison we feel today, Archbishop thinks, - poison what is being poured out in our society. We often give up and say: “Oh God, who will save us from our evil, our own untruth? Similarly, Israelites besides fighting against outer enemies, who took their land away, had also to conquer an inner one, the sense of what laid in people’s disbelief concerning a gift of life and salvation, granting them by the Lord”. “Who can grant us salvation from evil what occupied our land today? And in this historical moment God establishes in front of our eyes a Cross of our crucified Savior and says: “Believe in power of a Crucified what can overcome evil. Believe in God’s love Lord feels to you. Don’t be afraid of clarity and frankness. Thank God we live in an open society where any crime or sin is widespread through social networks or media, as if it is displaced before the whole society. Precisely this frankness but not frankness in front of people’s eyes, frankness of our heart, an ultimate trust in God might become a moment of our salvation”, His Beatitude called to think over it.